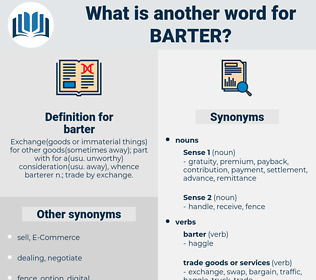 What is another word for barter? 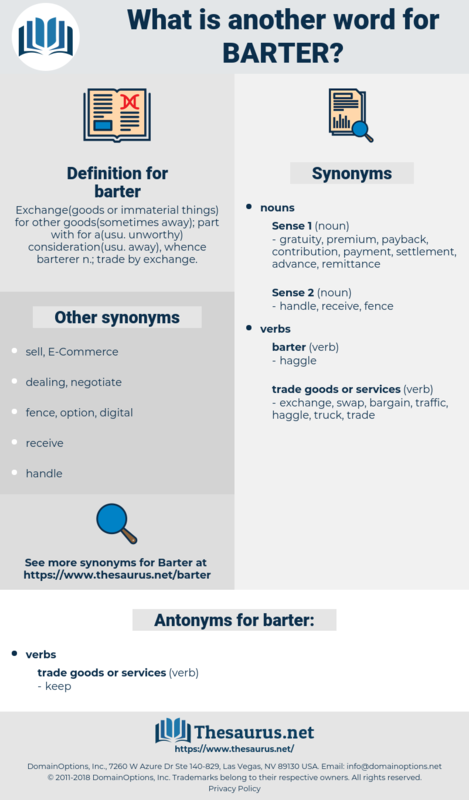 Exchange( goods or immaterial things) for other goods( sometimes away); part with for a( usu. unworthy) consideration( usu. away), whence barterer n.; trade by exchange. These warriors barter men as cattle. One realises that though monster guns and minenwerfer and strange scientific devices be the paper money of this war, now as ever the standard coinage - the bed - rock gold of barter - is still man's life. Bohr Theory, birder, border, burro deer, breather, barter away, broider, barretter, barrater, boarder, brooder, bourtree, barterer, Berteroa, brother, breeder, Barrator, broad arrow, borderer, Barratry.